NASA images courtesy the MODIS Rapid Response Team at NASA GSFC. Caption by Holli Riebeek and Mike Carlowicz. 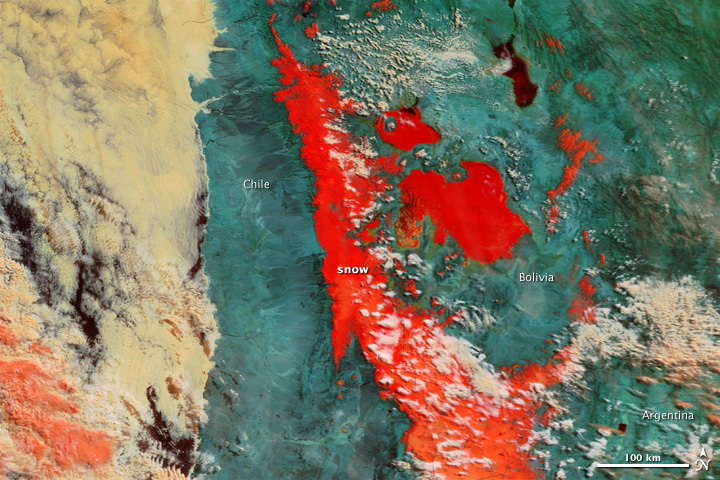 Ordinarily, the flashes of white in South America’s Atacama Desert rise from salt pans. 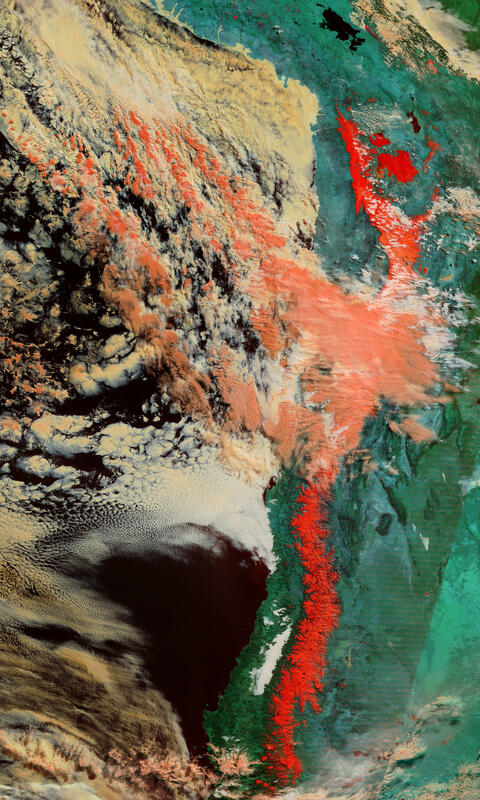 But on July 7, 2011, when the Moderate Resolution Imaging Spectroradiometer (MODIS) on NASA’s Terra satellite acquired these images, much of the white came from a far rarer commodity: snow. Starting on July 3 and lasting several days, a cold front dumped up to 80 centimeters of snow (32 inches) on parts of the driest desert in the world, reported BBC News. The images above show the largest snowfall the region has witnessed in a half-century. The top image provides a photo-like, natural color view of the snow. A few clouds hang over the desert, marring the view slightly. The lower image, which includes both visible and infrared light, helps distinguish between snow and clouds. Snow is dark red, while clouds are lighter shades of orange and white. How rare was the heavy snow? Parts of the Atacama Desert receive just 1 to 3 millimeters of precipitation per year (the local average is 50 mm, or 2 inches). This storm should skew the averages for some time. 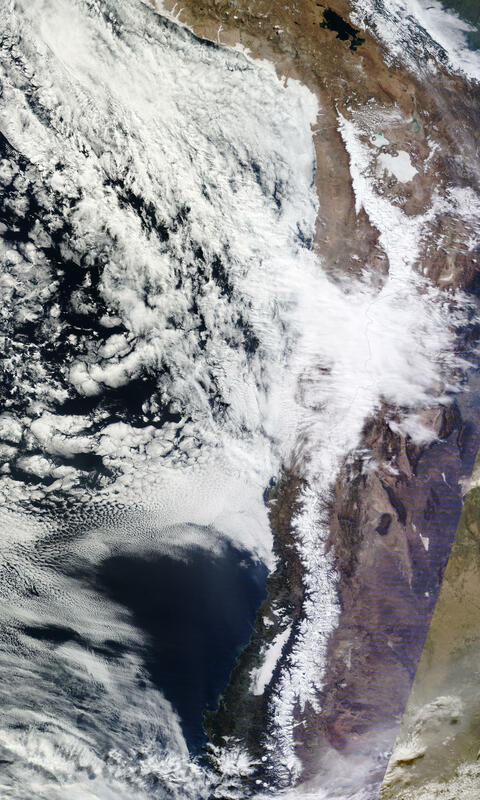 Along with the snowfall, the winter storm also brought temperatures of -8.5C (17.6F) to Santiago, Chile. Parts of Uruguay and Argentina also coped with freezing temperatures. Several major copper mines were shuttered and overland transportation was snarled due to the snow, heavy rains, and flooding, according to news reports. More than 5,000 people had to abandon their homes in northern Chile, as many roofs in the desert region are not designed to withstand rain. 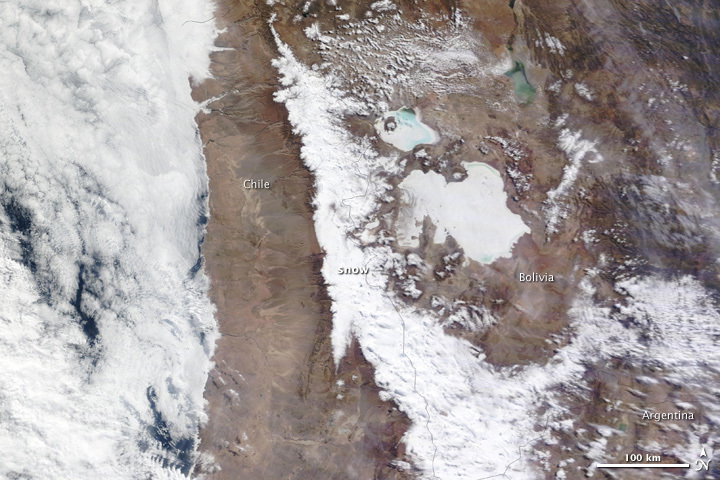 BBC (2011, July 7) Hyper-arid Atacama desert hit by snow. Accessed July 12, 2011. Reuters (2011, July 9) Chile's giant mines recover after winter storm. Accessed July 12, 2011. The Santiago Times (2011, July 5) Strong weather hits northern Chile hard. Accessed July 12, 2011. The Santiago Times (2011, July 4) Unusual rainfall and snow in Arica closes Chile-Bolivia border crossing, Accessed July 12, 2011.